Hi! At Wine Club Reviews we review companies that offer wine club subscriptions and sell wine gifts. This is a review of Cellars Wine Club. Cellars Wine Club goes out of its way to find palate-pleasing wines for all different types of wine-buying customers. They’re a savvy marketing firm who really wants you to believe in the wine clubs they provide. You can expect to receive a great selection of wine from Cellars Wine Club and while you won’t love every wine they send you (that’s just impossible), you will enjoy most of them and probably some new favorites along the way. 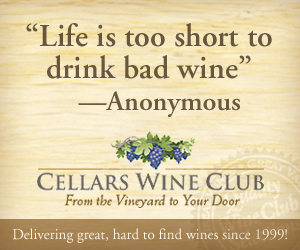 Another great reason to join a Cellars Wine Club is the variety of subscriptions they offer. Let's say you get your feet wet with their excellent entry-level Premium Wine Club, and a few months goes by and you realize you really like red wine more than white wine. You can easily switch to the Red Wine Trio club without hassle. Or let's say you're inspired to add a little pep to your weekly wine drinking... you can add a subscription to the Sparkling Wines Club and enjoy those bubbles for any occasion. Among other things, Cellars Wine Club is only a wine club. They don’t have a vested interest securing great deals for their private-label customers (because as far as we know they’re not in that business), they don’t have a publication to run and worry about which wineries they’re promoting, and they do have a vested interest in keeping their subscribers happy as its their only revenue stream. We think this keeps them thinking about the best wines to pick every single month for every single wine club. Wine packaging is manufactured using recycled material - old newsprint and corrugated cardboard. In fact, much of it is collected in the communities where wine trays are sold - further reducing the carbon footprint. The manufacture of the wine trays is one of the few in the U.S. that doesn't discharge waste water. All of the water used in the process is recycled losing only a small portion to evaporation. water is not wasted! The manufacture’s primary energy input is clean, renewable hydro power. Energy recovered projects have reduced natural gas consumption by 20% - heat is recycled to dry the wine trays. All these elements add up to a fully sustainable package. After you receive your wine shipment, simply compost the trays or toss it in the recycle bin.